Johnson County Septic has been locally-owned and operated in Joshua, Texas since 2006. We’ve treated every customer like they were a part of our family. Here at Johnson County Septic we specialize in septic tank cleaning and pumping. Our company can locate your septic tank(s) and clean them thoroughly. We strongly recommend that you maintain a routine of keeping your septic tanks pumped to help prevent any solids from building up as well as to minimize any cost of repairs down the road. Below is a brief summary of conventional systems and aerobic systems; how they work and some simple guidelines on how to care for and maintain them. The septic tank provides the first step in treatment using natural processes to partially treat the wastewater. Its primary purpose is to protect the drainfield and the receiving soil from being clogged by suspended solids in the effluent. The wastewater discharged from the home flows into the tank where heavier solids settle to the bottom to form a sludge layer. Lighter materials such as soaps, fats, grease, etc., float to the top forming a scum layer. Micro organisms (naturally occurring bacteria in the waste stream) digest or break down the waste solids helping to reduce the volume of sludge and scum. This biological process can only reduce about 40% of the sludge and scum. The tank(s) must be pumped regularly to remove the accumulated solids. This will prevent them from being washed out into the drain field where they can clog the soil and create potential system failure. A septic tank is a large watertight container buried in the ground outside of the home. It provides the primary level of wastewater treatment. Tanks are usually constructed of concrete, fiberglass, polyethylene or plastic. 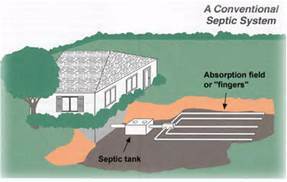 Clearly aerobic septic systems are the one system that can be applied in almost any situation where septic systems are required. When you own an aerobic system you are basically the owner of a small version of a municipal sewage plant. That is, your aerobic system mirrors many of the steps and activities performed by an urban waste treatment plant. 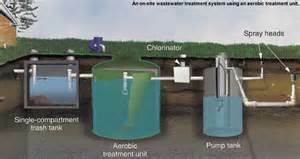 Aerobic systems are similar to septic systems in that both treat wastewater using natural processes. However, unlike the conventional septic system, the aerobic system injects oxygen via a pump into the tank. This increase in oxygen increases the natural bacterial consumption of waste within the system. The best aerobic systems provide a pretreatment tank as well as a final treatment tank with unstabilized chlorine. At this point the resulting discharge water is clean enough and pure enough to be discharged via sprinklers directly over the absorption field. This is a real plus to home owners who don't want to clear trees to create an absorption field and to other homeowners on lots close to a body of water that might otherwise be subject to potential pollution. Aerobic systems work like this: Wastewater and effluent enter a pre-treatment tank where grease, oils, toilet paper, and other solids and foreign materials are captured. This helps to reduce the amount of solids entering the aerobic chamber. Too many solids can clog the system and cause malfunctions. Next, the wastewater enters the aerobic chamber where air is compressed and forced into the wastewater to increase the growth of beneficial bacteria that consume the solids. However, not all solids are consumed by the bacteria, so the mixture next enters a setting or clarifying chamber where any remaining solids can settle. Next the treated water moves to a pumping chamber where is receives a final treatment of unstabilized chlorine. This is not the same chlorine as you use to shock your pool, but rather a highly concentrated, tablet form of chlorine specifically designed for the treatment of wastewater. A float valve within the pump chamber will signal the pump to discharge the water to absorption field. This treated water is then piped to the field and dispersed via pop-up sprinklers.